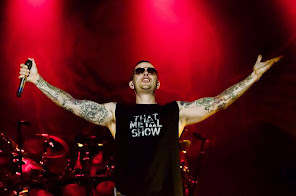 Avenged Sevenfold News: Avenged Sevenfold's M.Shadows: "We were working on the game before we..."
Avenged Sevenfold's M.Shadows: "We were working on the game before we..."
I know ‘Hail to the King: Deathbat’ is a few years in the making, and obviously your ‘Hail to the King’ album has been out there for a year-plus, as well. Curious, did one thing inspire the other in any way or were they completely separate entities? Two separate entities. We were working on the game before we were — I think the game idea came before we even started writing the concept for ‘Hail to the King.’ The game was obviously not called ‘Hail to the King’ at the time. You’ll see a lot of the old music is in the game, there’s no ‘Hail to the King’ music in there, but the title is ‘Hail to the King’ because it just made sense. When we were thinking of titles: Deathbat, king on the album covers. He’s the king. So, it just made sense. We just had a deathbat so people could differentiate the two. They really have no relation other than one is just telling the story of this character that happens to be on everyone’s album cover.